I am a cyclist. Cycling is a central part of my core identity. To my friends and family, I’m the “bike guy”. I love riding for work, fun, sport, and I’ll do it just about anywhere, regardless of the conditions. I even advocate for cycling improvements in my community, volunteering at events and even knocking on doors of residents. In other words, my interest in cycling goes a tad beyond what might be considered “normal”. Despite countless research that cycling is good for health, business, and cities in general, bike lanes consistently lead to polarized debates of “drivers versus cyclists”. Impatient and rude cyclists! Traffic headaches for drivers! These two timeless characters are pitted against each other time and time again, each of them unyielding and equally loathing of the other. But I’m sorry to say that while these characters make for great storytelling and news-grabbing headlines, they simply don’t represent the general population. Every day, people make decisions on how they will travel. Some choose to drive, while others take transit. For short trips, many people choose to walk. Increasingly in many cities, people are now choosing to travel by bike. What’s been learned from countless recent cycling projects is that when you make improvements that make travelling by bicycle safer, more people choose to ride bikes. Which brings me to my point: bike lanes are not for cyclists – they’re for people who ride bikes. Ordinary people, wearing ordinary clothes, who have chosen to travel by bike. Most don’t identify as “cyclists”, they won’t yell at you for cutting them off, they don’t blatantly run red lights, and you definitely won’t catch them sporting Lycra. Every morning, they simply get dressed for work, hop on their bikes, and enjoy the convenience of cycling. Take Toronto, for example. As of August, the Toronto Bike Share had already surpassed last year’s ridership, a protected bike lane pilot on Bloor Street led to a 49% increase in cycling volumes in less than a year, and the city’s bikeway on Richmond was carrying up to 674 bikes in a single hour. Even local conservative reporter Sue-Ann Levy has taken an interest in cycling, admitting to being a “born-again cyclist”. In vast stretches of the city, more and more people are riding bikes. Where is this growth coming from? More annoying “cyclists”? 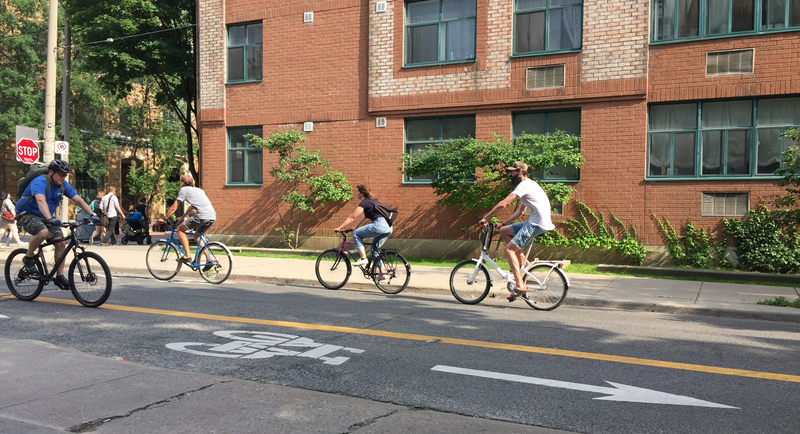 Nope – Toronto’s cycling growth is coming from more normal people choosing to ride bikes. Every time cities add new bike lanes, their cycling networks grow, and travelling by bicycle becomes a safe, convenient option for more people. But these new bike riders are timid, and just as quickly as they appeared, a reversal of safe infrastructure almost surely guarantees their disappearance. Unlike stereotypical “cyclists”, these people aren’t comfortable cycling in any condition. If you’ve ever biked with someone who’s new to cycling (or tried it for the first time yourself), you know this. Things that an experienced cyclist knows to look out for, like a right-turning car or an opening door, can be downright terrifying for someone new to cycling. A single bad experience can shatter someone’s confidence and they may never ride again out of fear for their safety. This is why we desperately need more protected cycling infrastructure that makes cycling comfortable and safe for all people who choose to ride bikes. As a cyclist, I don’t advocate for cycling because I want more bike lanes for myself. I advocate for cycling because I see it as part of the solution to the transportation, health, and environmental problems facing cities today. I’ve found inspiration from places like Amsterdam, which was clogged with cars just like North American cities not too long ago. Mostly, I find inspiration every day on my ride to work as I experience the growing number of ordinary people in Toronto who choose to ride bikes. This post is an adaptation of an article I wrote for the Toronto Star. I largely agree. There is however a huge difference in bike lanes (paint) and protected bikeways (cement). Painted bike lanes will max out at about 5% of the population. That’s what has happened in Portland. Most people are not comfortable, like 95% of the population, are not comfortable on most painted bike lanes. Protected Bikeways built to CROW standards max out at over 90% of the population. This is what has happened in The Netherlands where the average person rides about 950km per year. A big step down from CROW standards is what we see in Denmark which results in about 65% as much bicycling (annual avg of 650 km per person). Denmark is largely protected, except at junctions which scare many Danes from riding. Do we want to shoot for only the minimal modal share of Portland? Or the much higher modal share of Germany (17%), or Denmark or Netherlands? Agree wholeheartedly. I’m using the term “bike lanes” in a catch-all, general sense here to represent all bike infrastructure (“bike lanes” is the term the media tends to grab on to). But yes bike lanes in the literal sense are usually insufficient, as you mentioned. the fact that you dont know who other road users are scares me a little bit. Legally bikes are vehicles. A person in a car has the same rights as a person riding a bicycle. The difference is a person is a car has the responsibility to not kill others with their multiple ton machine. I’m truly sorry for you that you are at the point of considering murder of fellow humans because of your inability to deal with others using public space in different ways than yourself. When they put an extensive set of bike lanes here in my suburb, I thought the non-cyclists would hate them. Quite the opposite – they are very happy with the “traffic calming” aspects of the lanes. It was mostly speeding teenagers using the extra space anyway. Very good article and bang on. This has also been the experience in Ottawa which while having a great recreational pathway system for many years is now implementing dedicated bike lanes in the core, which have been a big success for the reasons you have outlined. wow, you all are very deep thinkers, and stat happy. I guess I’m a cyclist, MINNESOTA suburb in Washington county. I have committed traffic transgressions when the ‘juice’ interferes w/sense. The most notible instance is the blinking left turn arrow. Example: 2 lanes going west, one lane turnin left. The 2 westies have a green, they go, I am in lefty and the arrow is red. There are no cars coming/going east. Am I being clear here? There is no way I can influence the ‘arrow’ to turn green or even to flash orange (caution). So, I see not oncoming. North and South have Red, they are stopped. What to do? get off bike walk over to a button that will eventually turn a red hand into a white light of a waling person, or procede left, on red thinking only of myself. I am confessing here, more often than not that is what I do as a cyclist, at which point I get horn blowing from North and South, cat calls, fingers and fright on my part. The common denominator, (only guessing that that is a term to use here) is that most ALL cyclists know about DRIVING A VEHICLE in traffic, but most VEHICLE DRIVERS have not clue what it’s like to be a cyclist. I’m guilty, I try harder to not do the wrong so that I may live to see another day of cycling. Is this what social media is all about? I’m not a FB or TWEETER, or nothing like that, I’m just a 70 year old guy who is a cyclist is an area outside of a Twin City safe cycling/friendly (not so friendly really) zipcode. For fatalities of the day see the front page of the St Paul Pioneer Press for 11/19/17. Danger zones: Where pedestrians and bicyclists are injured most often in Ramsey County.